Victoria all-state seniors Brady Dinkel and Eric McAlonan delivered the final plays of the Eight-Man, Division II state championship game. Dinkel had his memorable 56-yard run on fourth-and-inches and dove past the goal line with two seconds left. He then tacked on the two-point conversion. On the last play, Argonia-Attica tried to run a series of laterals on the kickoff. McAlonan finished the year when he laid a big tackle on A&A senior standout Alec McDaniel. Victoria won 36-28 at Newton’s Fischer Field. Dinkel and McAlonan, though, faced adversity through the 2015 season and again Saturday. The ability to overcome obstacles helped Victoria finish 12-0. This year’s team joins the 1988 Knights as the only to cap perfect seasons for a program that has seven state crowns, among the top-10 in Kansas annals. The Knights, 12-1 last year, has won back-to-back titles for the first time and carries a 24-game winning streak. While Dinkel’s amazing story of missing seven games with internal organ problems and then returning at an elite level is well-known, McAlonan’s obstacles – especially Saturday – isn’t. McAlonan had a knee injury before the year and played little in Week 1’s big victory against Central Plains. For the next two-plus months, McAlonan again anchored the lines and paced the squad in sacks and tackles for loss. With 9 minutes, 57 seconds left in the third quarter, McAlonan again hurt his knee. Sophomore Cooper Pfanenstiel had to immediately step in and punt – and downed the Titans at the 7-yard line. McAlonan missed five plays and the Titans ran the ball better than they had all night. They carried the ball each time and collected 40 yards, including three for at least 11 yards. Those three carries marked the three longest of the game for A&A. McAlonan, trying to get healthy, walked up to line coach Alex McMillan and said he was OK.
On his first play back, Victoria forced and recovered a fumble. McAlonan then downed a punt at the A&A 2-yard line. After the Titans recovered a Knights’ fumble with 2 minutes, 12 seconds left and the game tied at 28, McAlonan sacked McDaniel for a six-yard loss on first down. Two plays later, the Titans punted to set up Dinkel’s final play. “You are definitely scared, but credit to him to come back into that ball game, and play without any fear and make plays for us down the stretch, and obviously finish the crazy (kickoff) play at the end,” Oberle said. Dinkel was only offensive skill player to move the ball effectively versus the Titans’ much improved defense. He took over at quarterback again when Joe Dortland, who had played brilliantly and went 9-0 as the primary quarterback, broke his collarbone at the start of the sub-state championship. A&A ran 62 plays for 365 yards and limited Victoria to 49 snaps for 319 yards. McDaniel, who Oberle labeled an “absolute stud,” finished with 213 passing yards and four scores, rushed for 85 yards and collected a team-high 18 tackles. Dinkel ran 11 times for 173 yards, including a 79-yard touchdown at the end of the first half and the final score. He rushed for four scores, passed for one and recovered two fumbles on defense. The rest of the Knights rushed 26 times for 71 yards. Dinkel’s and McAlonan’s play helped Oberle win his third title in 10 years as head coach. His first crown was a 40-12 victory against Hope in 2006. Last year, the Knights defeated A&A, 52-8. This season yielded a physical, comeback victory. Oberle is now tied with several all-time great coaches with three titles, including Solomon’s Steve Tiernan (two Baileyville B&B, one Osborne), Kevin Ayers (two Jetmore, one Wallace County) and Northern Valley’s Chuck Fessenden and retired Sylvan coach Mike Weatherman. Fessenden and Weatherman each won theirs at one school. In the Eight-Man, Division I game, Spearville defeated Hanover, 62-16, in a game that ended in the third quarter by the 45-point mercy rule. The 13-0 Lancers won its first title in school annals and became just the third eight-man squad since 1991 to win a championship by the 45-point margin. Spearville’s great offensive line opened lines for 37 carries for 349 yards and seven scores. Senior quarterback Nathan Stein completed 4 of 6 passes for 56 yards with a touchdown and an interception. The Lancers are one of the most efficient offenses in state annals. 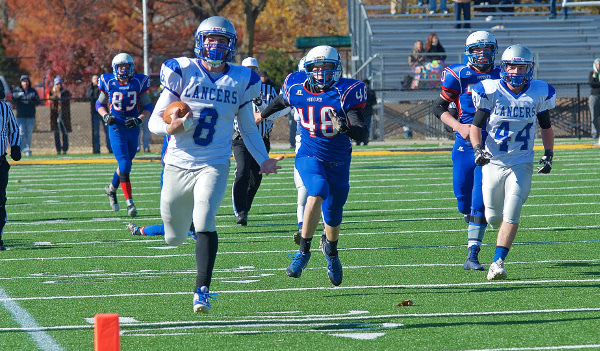 Stein’s interception on Saturday marked the only turnover all year for the Lancers. Spearville averaged 9.91 yards per play with Stein, junior Luke Heskamp, senior Brandon Davis and sophomore Bailey Sites in the backfield. The front is anchored by seniors Dakota Kreger and Brady Sherraden and juniors Wyatt Strecker, Kyler Stein and Jordan Knight. Senior lineman Elias Brownlee finished second with 61 tackles. “They have been excellent all year, staying on blocks, just driving them down the field,” Heskamp added. In 2013, Osborne, which holds the state eight-man record with 760 points, averaged 8.8 yards per play. Spearville outscored teams 720-140, or an average margin of 55-11. That’s on par with 2012 Ness City – arguably the most dominant team in recent eight-man history – which had a margin of 49-6. “The battle at the line of scrimmage is always the biggest part of any game whether a team is running or passing, the line of scrimmage has to be won, and those guys have bought in,” coach Matt Fowler said. “They have clicked, they’ve been physical.